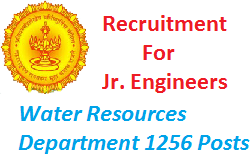 Water Resources Department of Maharashtra Government invited application from the eligible candidates through On-line for filling up the vacant Posts of 1256 Junior Engineer (Civil) for Job Locating at Maharashtra, India. Interested and Eligible Candidate can apply On-line before the last date, 08 March 2016. All Information about Position educational qualifications, age limit, selection and application process are given below. Educational Qualifications: Applicants should possess Diploma in Civil Engineering and passed MS-CIT examination. Number of Posts: 1256 Posts. Age Limit: Applicants age should be in the age group of 18 to 33 years (Age as on 18.02.2016). Pay Scale: Selected candidates will be paid in the pay band of Rs. 9300-34800/- Plus Grade Pay Rs.4300/- Per Month. How to Apply: Interested and Eligible Candidates may apply online through the website https://maharecruitment.mahaonline.gov.in between 18.02.2016 to 08.03.2016.